No one can argue the benefits of bringing home a furry, four-legged friend; they offer companionship, unconditional love, and endless entertainment! However, they also happen to be tiny tornadoes just waiting to be unleashed in a flurry of hair and sharp claws. As a responsible pet owner, you are required to make a few changes or alterations to your home, just like if you were baby-proofing — except the goal is to protect your house from your pet, not the other way around. When it comes to the damage that can be wrought by a hyperactive puppy or a bored kitten, your furniture is the most at-risk. 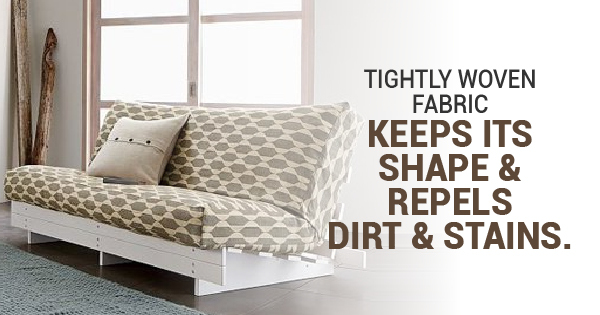 Here are the three best, most durable fabrics — put best to use in the form of slipcovers to provide maximum protection — available to keep that expensive sofa nice and safe. Outdoor: Outdoor fabrics are usually specially treated to repel water, stains, and even bacteria; this means that your furniture will smell as fresh and clean as it looks. However, if bringing a piece of outdoor furniture indoors doesn’t mesh with your decor, you can invest in an outdoor fabric cover — if your pet owns a certain piece (we all know how pets can be), you can purchase sectional couch covers or pillow covers to keep them safe. Although outdoor fabric can feel less luxurious than the following options, it is one of the strongest types available for fighting against fur and felines alike. Denim: Some diehard denim fans may claim that the material only belongs in jeans and jackets, but they haven’t seen the versatility of denim couch slipcovers. Offering a material that is able to withstand even the most rambunctious of pets, the informal fabric is easy to clean, vacuum, and comes in a variety of shades and designs — trust us when we say it won’t look like you’ve re-purposed some old jeans. Denim sectional couch covers will become the new stars of your living room as your pets race all over them and don’t leave a single scratch behind. Woven: The secret to woven slipcovers (or upholstery in general) is in the tightness of the weave; tighter weaves are more resistant to stains and actually repel dirt, and are also able to keep their shape longer. If your sofa sees a lot of use, both from humans and animals alike, tightly woven sectional couch covers can provide an excellent layer of protection against everyday damage and that caused by wildly bounding and energetic puppies. Durable, easy-to-clean fabric is the secret to success when it comes to new pet ownership. Don’t let your messy companion rule the household; purchase slipcovers (even pet bed covers!) made from these materials and your pets will know who’s in charge.